Even its decent quarterly earnings report at the end of the month couldn't help Eagle Rock's shares from the energy wide declines. 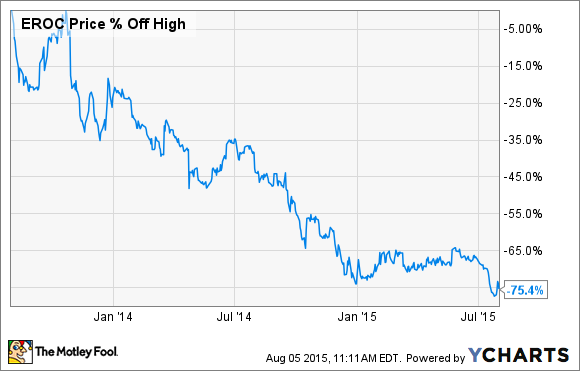 What: Shares of Eagle Rock Energy Partners (UNKNOWN:EROC.DL) had another bad month in July, sliding another 23%. Over the past two years, Eagle Rock's stock has been on a precipitous decline and since Aug. 1, 2013, shares are down a ghastly 75%. So What: Eagle Rock is much more a victim of the broader energy market than any fault of its own. In the month of July, the price for a barrel of West Texas Intermediate declined by 12% to less than $50 a barrel. Even with Eagle Rock's current hedging portfolio in place, which will mitigate a lot of the pain for 2015 and to a lesser degree 2016, still too many investors fear low oil prices will continue to pinch profits at upstream oil and gas producers. Eagle Rock also gets lumped in with one of the riskier components of the oil production family: upstream master limited partnerships. To be fair, though, Eagle Rock is in a much better financial condition than many of its peers. Over the past two years, it has made some rather aggressive moves, such as selling off its midstream assets. And what the company did with those asset sales was rather smart: Instead of taking the deal in all cash, it also retained an equity stake in Regency Energy Partners -- now Energy Transfer Partners -- which generates some additional cash flows outside of its traditional cash from operations. The cash from these investments has helped to not only offset capital expenditures, but it has also helped to pay down debt. Today, Eagle Rock's net debt to EBITDA ratio stands at 0.73 times, which when compared to many of its peers is a spectacular figure. Now What: If you are looking at this from a long-term perspective, then the merger with Vanguard makes it a little difficult to determine whether now is the time to look at buying shares of Eagle Rock. After all, a long-term investment today might mean you are a shareholder in the combined company, and it's hard to make a commitment to a company without seeing its financial performance. Until things shake out with this Vanguard deal, it's probably best to sit on the sidelines for this one, despite the fact that today Eagle Rock Energy Partners might look a little attractive as a stand-alone investment.